Karuizawa is a well-known summer resort town just an hour away from Tokyo on the Shinkansen. To travelers who wish to spend a leisurely trip in nature-filled Karuizawa, we recommend staying at HOSHINOYA Karuizawa, a highly regarded Japanese resort village. HOSHINOYA Karuizawa is a lodging where guests can fully enjoy the beautiful natural landscape of Karuizawa. The guest pavilions dot the village-like area, where water flows through the terraced hills. All meals here are cooked from local ingredients, and there are various activities offered related to the outdoors, designed to give travelers a full experience of the bountiful nature in Karuizawa. Guests staying at this resort will enjoy the verdant forest, the sound of the river flowing, and the crisp, clean air. The peaceful surroundings help us regain and remember what we have forgotten during the busy state of everyday life. 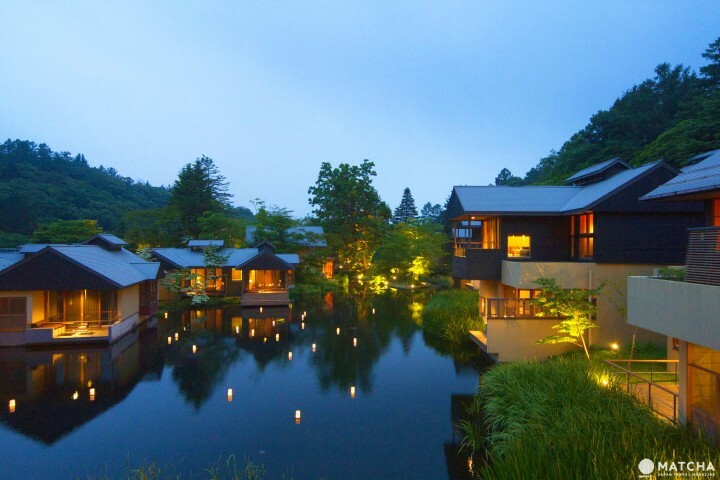 This article is about the special experience at HOSHINOYA Karuizawa. At HOSHINOYA Karuizawa, visitors check in at the reception, a special building which serves as the gateway to the guest pavilion village. The lush forest and the Yugawa River can be viewed from the window. At the reception, a welcome drink is served while the guests listen to the music from the yagura (*1). Here you can clear your mind and look forward to your stay at the village. *1 Yagura: A set of traditional Asian percussion instruments. 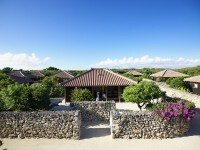 The village formed by the guest pavilions offers a breathtaking view. The guest pavilions are located in a garden resembling the Japanese tanada (terraced rice fields), dotted with creeks and trees. Here one can enjoy the scenery of the Tanada Terrace, with the sound of the small waterfalls soothing your mind. The guest pavilions are a hybrid of Japanese-style architecture and modern convenience, providing the ultimate comfort. During your stay, enjoy the surrounding scenery to your heart's content from the adjoining terrace. There are three types of pavilions: Mizunami (with a view of the pond), Yamaroji (with a view of the forest), and Niwaroji (with a view of the garden). Each room is designed differently from the other. For further information about the rooms of HOSHINOYA Karuizawa, please check their official website. Kasuke, the restaurant at the village, offers kaiseki cuisine (a traditional Japanese multi-course meal), prepared by the chef of HOSHINOYA Karuizawa. All the ingredients are local products, and the dish arrangements are inspired by the forests and mountains of Karuizawa, providing diners with a feast for the eyes. Japanese-style breakfast is served at Kasuke. The guests can also have either a Japanese-style or Western-style breakfast brought to their rooms. Taking in the view from the terrace during breakfast is another special experience offered at HOSHINOYA Karuizawa. To learn more about meals, please check their official website. HOSHINOYA Karuizawa offers two onsen (Japanese hot springs) options. Meditation Bath is an exclusive facility for guests, and Tombo-no-yu is located at a five-minute walk from the village. The former is also used for therapeutic purposes, and the latter has a spacious indoor bath, along with a spacious outdoor bath. The Karuizawa hot springs are known for their therapeutic effects and are thought to offer benefits to the skin. Be sure to try the hot springs at HOSHINOYA Karuizawa. Information about the hot springs is available on the hot springs section of their website. HOSHINOYA Karuizawa offers activities aimed to improve the guests' health, such as the ONSEN Body Work and Mind Work, which is a special workshop held at the Meditation Bath. The workshop last around an hour and uses meditation and light workouts to improve your physical fitness. There is also a tsubo and okyu workshop, where guests can try okyu (moxibustion, a traditional medical practice) which helps to fine-tune health. Participants learn about tsubo (acupoints) and place burnt moxa (a type of herb) on their skin to provide stimulation to the body. The flame from the moxa does not touch your skin, so it is a safe and pleasant experience. A pamphlet about moxibustion and a small quantity of moxa will be handed out after the workshop, so you can try it again at home. For further information about the health and fitness related activities at HOSHINOYA Karuizawa, please check the activity section of their website. 7. Eco Tours - Watching Flying Squirrels in the Forest! Guests at HOSHINOYA Karuizawa can join various nature tours hosted by Picchio, an eco-tourism organization. In particular, we suggest the tour where you can watch flying squirrels. A flying squirrel is a wild animal which uses its cape-like membranes to fly from tree to tree at dusk. The participants receive a short lecture about this animal which is specific to Japan and then walk into the woods. Watching the unique flight of the squirrels is a really thrilling experience. Those who wish to learn more about Picchio's eco tours should take a look at their official website. HOSHINOYA Karuizawa is an accommodation facility where guests can spend their time leisurely, surrounded by nature. To make the most of your visit and enjoy the hot springs along with the various activities here, we recommend guests stay for at least two nights. We hope you have a wonderful stay at HOSHINOYA Karuizawa, a resort offering a new experience that will refresh your mind and body. To check room availability and make reservations, please take a look at this page. Access 15 minute ride on the shuttle bus/taxi from JR Karuizawa Station. Nikko Pass Trip: Day 1 - Enjoy The Breathtaking Nature Of Nikko!